How Firm a Foundation is the Argument from Ephesians 2:20? 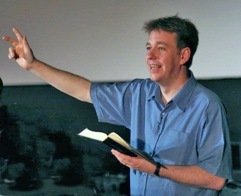 Ephesians 2:20 is a verse sometimes cited in support of the assertion that prophecy has ceased–which in turn serves as partial evidence for a more general cessationist position. One problem I’ve had writing on some verses relevant to the cessationist controversy is that I have difficulty seeing an actual basis for argument in the text. I don’t want to say that cessationists’ use of this verse gives proof-texting a bad name, but I am frequently amazed at how cessationism seems to create straw men in defense of it’s own positions. What I mean is that the argument based on this verse is so weak that I am surprised when cessationists bring it up. The reason I say it is weak is that it requires a string of questionable inferences to get from A to B. A chain with nothing but weak links is manifestly a weak chain, one I wouldn’t care to place much trust in, if I were you. The basic idea in the cessationist argument is that if prophets are said to be a component of the “foundation” that their function is limited to an initial stage of construction–a stage now completed–and therefore should no longer be expected to be present. It is, I suppose, satisfying to the already convinced, but is impeachable at multiple stages. First inference: Paul is referring to contemporary–New Testament era–prophets. It is reasonable then that Paul would be presenting a combo platter, one from column A and one from column B. I actually think this is what is going on, though I do not purport the sampling of data I have cited is sufficient to demonstrate it–only to put into question a cessationist use of the verse. I should say something at this point about Grudem’s argument on this verse, which in my opinion misuses the Granville Sharp rule. I have to admit I had thought he had long since retracted this argument, since being better informed on the grammatical point by Daniel Wallace. However, though he edited his text to reflect Wallace’s objection, he does stick with it. I think he takes the wrong tack here, the grammar being against it. To recap what is involved, in Greek, when two nouns share a single article it forms a structure like one box containing two objects. If–and only if–those two nouns are singular, this forces identity of referent, both nouns necessarily indicate the same entity. This does not work if the nouns are plural. And in Ephesians 2:20 the nouns are plural. 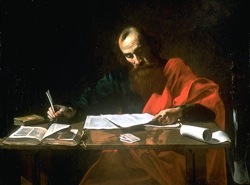 Furthermore, Paul could well have in mind, by metonymy, the authoritative writings of the two eras, summarized as “the prophets” for the Old Testament, and “the apostles” for the New Testament. This is similar to other phrases which refer to the Scriptures. One objection to what I suggest is the order of the nouns, that if Paul meant the Old Testament prophets and New Testament apostles he would have said “prophets and apostles” (i.e. chronological order) rather than “apostles and prophets.” I don’t think this is necessarily so from a psychological viewpoint. True, if he’s picturing a historical timeline, he’ll likely say “prophets” before “apostles.” But if he’s picturing his image of a temple with a foundation, he could well be starting at level and working down: this level is the apostles and below them the prophets. Basement and sub-basement, still a natural order. Second inference: that the metaphor of the foundation implies that prophecy is not used in further building. Let’s grant for sake of argument at this point that Paul did have in mind people prophesying in the church. The cessationist argument extrapolates from a metaphor. Certainly, Paul would mean that prophecy is foundational to the church. Is it a valid implication of this metaphor that prophecy is only foundational and not useful for building beyond the foundation? What does Paul himself say? Each instance of “builds upon/builds on” is epoikodomeo (likewise v. 14). Note also that the metaphor varies. Here Christ is said to be the only foundation, with nothing about apostles or prophets being part of the foundation, as in Eph. 2:20, where Christ is said to be the cornerstone. A metaphor is a metaphor, and serves its purpose in its context. Is there some reason to take Eph. 2:20 as the definitive description? Such an all-encompassing description of reality that we can draw inferences of cessation from it? Two chapters later we find similar language making a related point. The impact of these verses is often obscured by the rendering “edify” in some translations, but this is simply an anglicized form of the Latin aedificare, which means “to build,” like its Greek cousin oikodomeo, with both figurative and non-figurative uses. But at the very least 1 Corinthians 14 calls into serious question the limitations purported for prophecy based on Eph. 2:20. Third inference: that the metaphor in Eph. 2:20 takes precedence over other Scriptural statements. And in the last days it shall be, God declares, that I will pour out my Spirit on all flesh, and your sons and your daughters shall prophesy, and your young men shall see visions, and your old men shall dream dreams; even on my male servants and female servants in those days I will pour out my Spirit, and they shall prophesy. Where’s the controlling center to be? In the one metaphor of Ephesians 2:20? Why? Fourth inference: if prophecy has ceased, being foundational, it is reasonable to suggest that other gifts have ceased. I’m not saying this one would be asserted in a careful argument, but I can testify to hearing Eph. 2:20 being tossed out as evidence for cessationism in general, though strictly speaking it refers only to apostles and prophets. It certainly is not from this verse that we learn of the cessation of the gifts tongues, healing, miracles or any of the usual suspects. In fact, if anything the verse would imply that all other gifts continue. If the foundation consists of apostles and prophets, then everything else, including tongues, healing, and miracles are by definition non-foundational. They are building material. The verse then–if we grant the basic premise–is a subtantially useful one for the continuationist perspective. In point of fact, whereas the foundation of the church is a solid one, Eph. 2:20 makes a poor foundation for a cessationist perspective. It simply cannot support the weight put on it by some who draw from it inferences without logical basis. Let each man be careful how he builds. The wise man does not build upon sand.